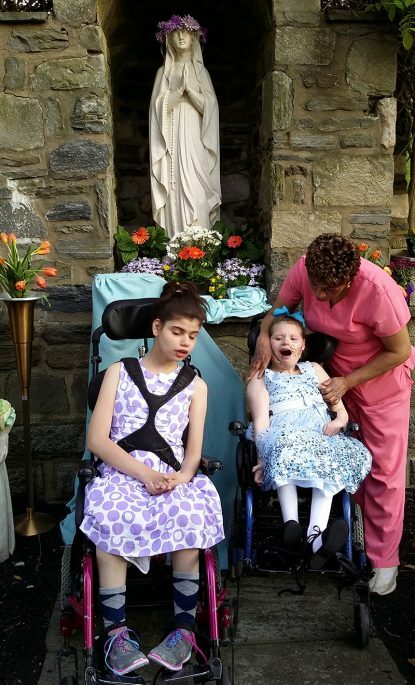 Tambourines, handclaps and a rocking version of “Hail Holy Queen” capped an annual May procession celebrated by more than 80 children and adults served by the developmental programs of archdiocesan Catholic Social Services. Members of the Don Guanella and Divine Providence (DGDP) communities traveled May 9 to St. Edmond’s Home for Children in Rosemont, which hosted the ceremony at its outdoor Marian grotto. The event marked the 17th year that the two groups have teamed up to honor the Blessed Mother. Together, the DGDP communities and St. Edmond’s Home form a continuum of care that Catholic Social Services provides to individuals with intellectual and physical disabilities. St. Edmond’s Home serves medically fragile children from ages six weeks to 21 years, while the DGDP communities offer a wide range of resources and support for developmentally disabled adults. Following hymns, prayers and a Scripture reading, St. Edmond’s resident Cailyn Longo placed a crown of flowers atop the statue of the Blessed Mother, assisted by activities coordinator Julia Vivanco. Members of the DGDP communities took turns reciting a decade of the rosary, with participants adding their own expressions of prayer and petition. The crowd then sang to a gospel-style recording of “Hail Holy Queen” from the movie “Sister Act” while playing tambourines and maracas. Father Dennis Weber, S.C., who presided over the May procession, agreed. “These individuals have as much spiritual depth as we do, if not more, because it’s coming from a spirit of innocence and deep love,” said Father Weber, the director of ministry and mission for the DGDP communities. Marian devotions such as the annual May procession highlight this spiritual depth, Father Weber added. The May Procession was a much waited event for those of us who wanted to become a Sister. Being one of those girls wanting to join the convent I was particularly interested in making certain to give Mother Mary her just due. My life took a different path, after the car crash I was in, having raised my children to adulthood I was ready to pursue the calling from the Lord to devote myself to His works. I reached out to the two convents that have women who were in my position only to discover I was two years too old. I maintain my vow of Chastity to Our Lord.